The bicycle was the first step away from the reliance on the horse for transport and the dawn of personal mechanical transport. The cycle liberated people from the areas they lived in and brought about immense social change allowing many ordinary people to move more freely around the country, a fact which is often overlooked by historians preferring to attribute such change solely to the railways! Indeed it is the bicycle which is credited with reducing in breeding in small communities! Bicycles originated in vague form in France around 1770. The first bicycles were quite amazing contraptions and when one thinks of the perilous state of the muddy cart track roads with a multitude of potholes it is difficult to imagine anyone being able to successfully cover any useful distance. 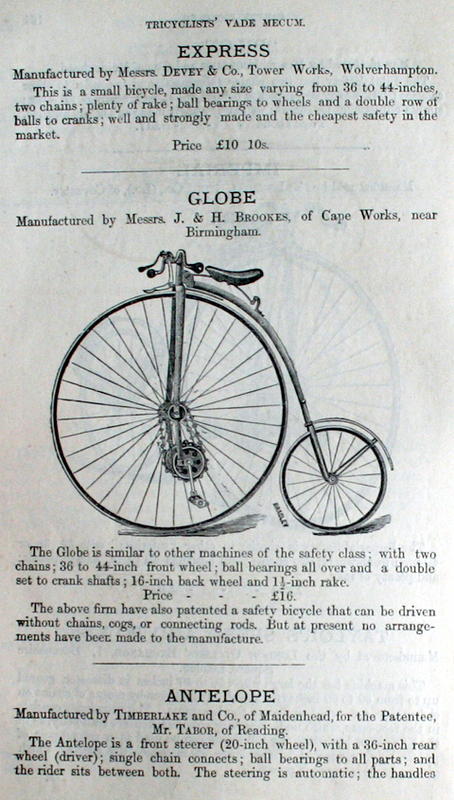 As with every invention there is always a multitude of people ready to improve on an original design and the bicycle was certainly no exception. For instance, at the turn of the century in Washington DC there were two buildings that held every patent in the U.S.. One building held patents covering every type of product you can think of and the other was reserved specifically for bicycle patents. It is difficult to be sure who exactly invented the bicycle but the Individuals mentioned below were definitely at the forefront of its development. Around 1818 to 1820 the very basic Hobby Horse or Running Machine was invented by a German Baron named Karl Von Drais and was propelled forward by the riders toes or feet running directly on the ground. Patented in France in 1818, this invention was improved during the 1860s when two French brothers, Ernest & Pierre Michaux, fitted pedals to the front wheel. Their machine was known as a Velocipede or boneshaker. These machines, manufactured in France by Cie Parisienne became the first commercially made bicycles. 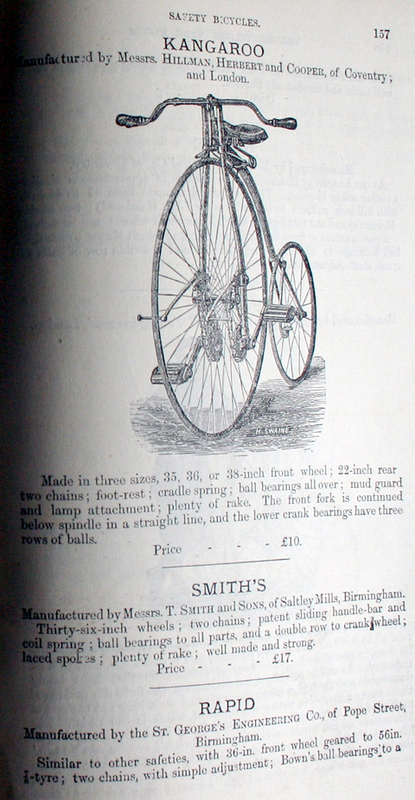 Kirkpatrick McMillan, a blacksmith from Dumfriesshire, also developed a pedal powered Hobby Horse which used cranks. He gave a public demonstration of his machine with a 70 mile ride to Glasgow in 1842. This would seem to be an important landmark in bicycle design and the start of the development of what was to be known as the safety bicycle (near equal wheels, low diamond frame, pedals to chain transmission) however some historians dismiss McMillan’s contribution. The unequal diameter ‘ordinary bicycles’ (penny farthings etc) were unstable and difficult to mount and dismount and therefore only popular with enthusiasts and of course totally unsuitable for women to ride. The reason large front wheeled bicycles were made was to stop the machines going down into the potholes that were strewn all over the road, remembering that the wheels were just solid metal, there were not even solid rubber tyres at this stage! All of these men were Midlanders and is most likely one of the reasons why the motorcycle and car industry has always centred around the Midlands and in particular Birmingham, Coventry & Wolverhampton. These areas also had an established flourishing tube manufacturing industry which was essential for bicycle frame manufacture. 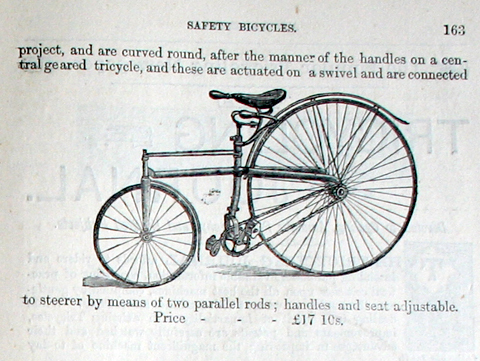 The inventor of the safety bicycle was claimed to be Harry John Lawson, his lever safety bicycle of 1876 is exhibited at the Coventry Transport Museum and his patent was registered on 30 September 1879.Lawson had been instructed by a relative to make his bicycles safer and this he set out to do. Harry Lawson also claimed that he invented the first petrol powered motorcycle and also patented that on June 25th 1880. He also claimed to have been responsible for the repeal of the act that insisted on all motor vehicles being preceded by a man with a red flag. There is no doubt that Lawson wanted to totally control both the cycle and motor vehicle market but he was later sentenced to a years hard labour for fraud. He was undoubtedly at the forefront and one of the pioneers of motor transport but it seems he was also prone to exaggeration and sharp practice at times! 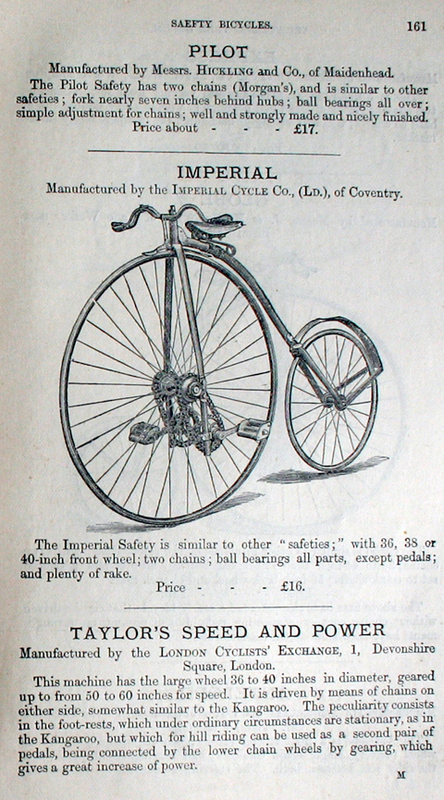 The first safety bicycle in production was ‘The Rover‘ designed by John Kemp Starley of Coventry and was first exhibited at the Stanley Show in London between January 28th and February 3rd 1885 although prototypes were probably made earlier. Starley established the Meteor Works in Coventry to produce the machines. In 1896 production of The Rover had been so successful the name of the firm was changed to The Rover Cycle Company. Starley’s Rover was the turning point in the evolution of the bicycle and he established a basic design which has changed remarkably little since then. Starley’s machine had a “geared-up” drive train so that the number of pedal revolutions did not equal the number of wheel rotations and was fitted with a drive chain and near equal sized front and rear wheels. 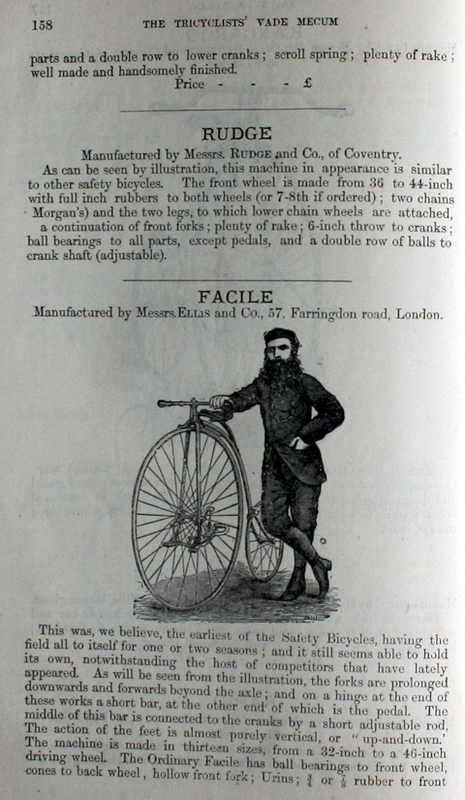 By the early 1890s the ordinary bicycle (non safety) was obsolete. 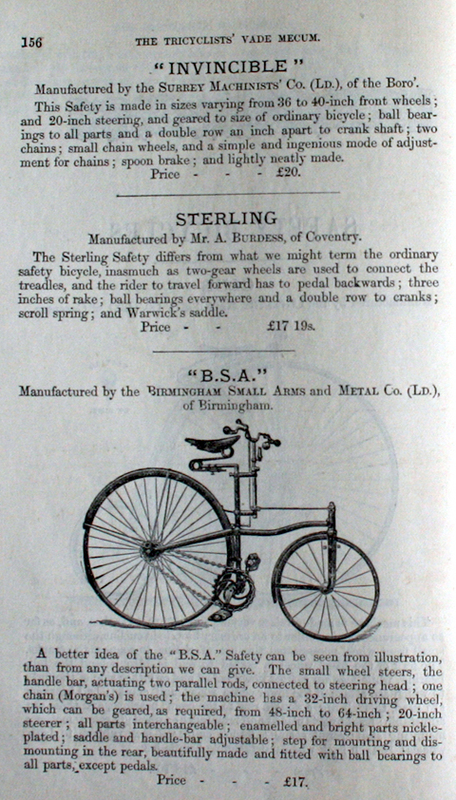 Starley’s Rover provided bicycling for the masses which after the introduction of the pneumatic tyre in 1887 by keen cyclist John Boyd Dunlop lead to an explosion in bicycle sales. Note, Dunlop was not the inventor of the pneumatic tyre; it was actually fellow Scotsman, Robert William Thomson (1822–1873), who registered the patent in 1845. Subsequently Dunlop bought the patent from Thompson who had done little with it. 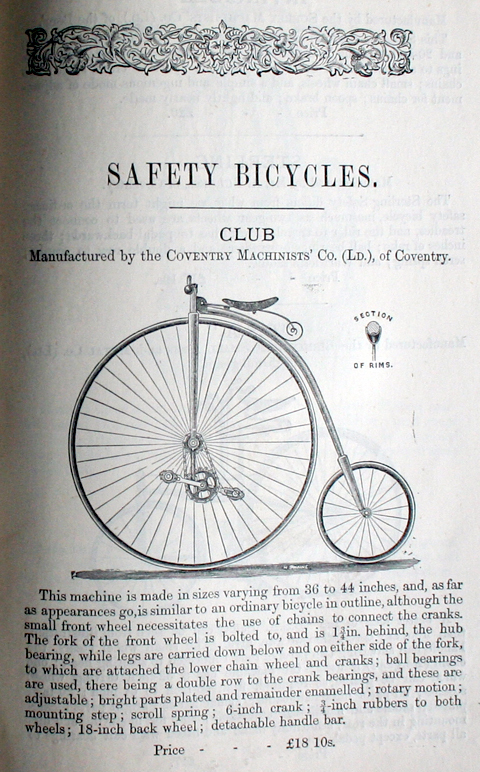 My edition of the ‘Vade Mecum’ for 1885 is interesting inasmuch as it was written before the landmark 1885 debut of the Rover Safety, as described above, and just two years before the pneumatic tyre changed cycling forever. 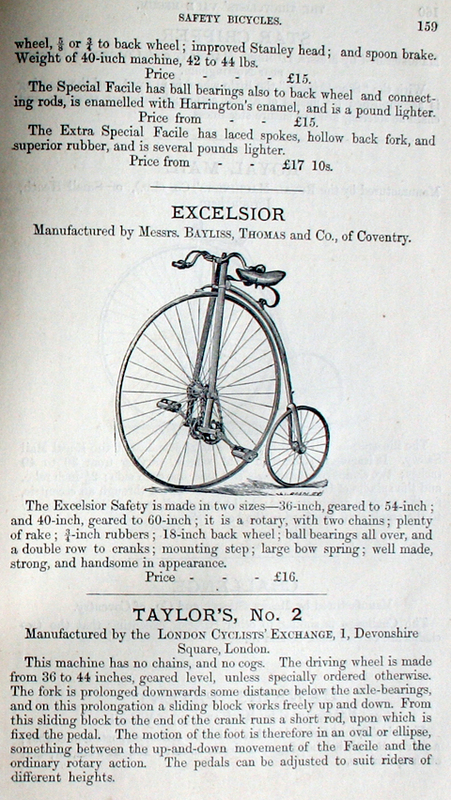 Bear in mind that it was essentially a tricyclists book – the era before the Rover Safety was essentially the tricycle’s heyday – so there was only a basic coverage of bicycles in the relevant chapter.